I’ve written before about the various community programs I’ve been fortunate enough to be involved in and how I’ve benefited from them. I’ve just been given another unexpected benefit that should be a lot of fun. The Cisco Champion community records a weekly podcast titled Cisco Champion Radio. Over the past two years, they’ve covered a broad variety of topics — you can see the full list of previous episodes here. On Tuesday 19 January, I will be helping to guest-host Season Three, Episode 2 of Cisco Champion Radio. We’ll be talking about IT predictions for 2016. Apparently, I unconsciously predicted this topic, so naturally I accepted the invitation to guest-host. 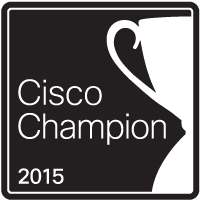 If you’re a Cisco Champion, please join us to share your thoughts on what’s coming. If you’re not, don’t worries — I’ll post a link to the episode as soon as it’s available. This entry was posted in Cisco, Podcasts and tagged CCR, Cisco, Cisco Champion, Community, Podcast. Bookmark the permalink.